Gone were the days when you had the extreme scarcity of cameramen in the Telugu film industry. In its sojourn of 75 years, most part of it witnessed execution of a director's order (Lights)…. Camera…. (Action)….. Cut… by technicians from Mumbai and Chennai. With the advancement of learning photography, there is a mushrooming of camera-handlers. The mortal rule "Survival of the Fittest" does apply to this most vital of the technical departments in filmmaking. Certainly, PG Vinda, hailing from a remote village Palem in drought-hit Mahabubnagar district, is one among them. Instead of demanding the producers for the best, he chose to give them the best he could. Starting his career with short film Grahanam (Eclipse), he focused his lens through the clouds of patience and perseverance and turned into a rising luminary in his chosen profession. His latest film Ashta Chemma made him the favorite of small producers who dream of visual splendor. He awaits the release of his next romantic "Vinayakudu", besides engaged to another film dreamily titled Sneha Geetham. 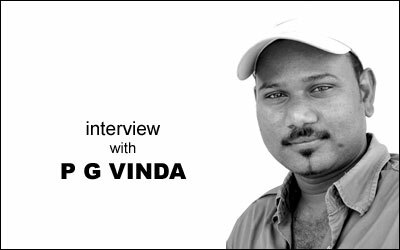 In an exclusive interview to Idlebrain.com, Vinda speaks about the cunning of established cameramen, tempting curves of heroines, kick for effective visuals and last but not the least – his love for art films for social awareness. Twists and turns in your career post Grahanam? I shall always be thankful to Mohan Krishna Indraganti for his big support to me. It was because of him that I got the foothold in this industry. I made my debut as full-fledged cameraman for Telugu feature film – Nandanavanam 120 KM – of Neelakanta. The opportunity came to me as Neelakanta was impressed with my style and framing in Grahanam and a couple of art films – Missing (2001) and Erase, the same year. I worked for about 50 days shooting Nandanavanam. This being a thriller, it caught the attention of Vamsi and he roped me in for his Anumanaspadam. While my latest film Ashta Chemma released last week, another film Vinayakudu will be releasing next month. My immediate project is Sneha Geetham of Lagadapati Sridhar and Madhura Sridhar combine. Why there is a gap in your career after Anumanaspadam? I don't consider it a gap. During this period, I read a lot about world photography, cameras, latest technology, equipment and such like. Of course, I also don't disagree with you. After all, I am at the budding stage. I can't fill my mind with so many assignments. I also tried my level best for projects. It was a constant struggle for a breakthrough. You can't expect everybody to click overnight. I liked the struggle. I enjoyed the moments which taught me perseverance and balance of mind at all times – either on the low or on the top. Coming to technology, only the fittest survive the best. What's your specialty? I can't boast of myself. But, to be truthful, I tried my level best to provide the best to my directors, which in turn to my producers. I shot Grahanam with digital format, using a TV camera and later I monitored its conversion into the film format. The result was tremendous. I got big appreciation from Mohan Krishna. It happened four years ago. His confidence in me once again roped for his project Ashta Chemma. I clearly understand the budget constraints of a film. I work as if I were a family member of the producer or the director. I did my internship for award winning Lazza. That time my knowledge was limited as a student. As a professional I should do justice to it. For this I should be educated. Though I took my diploma in photography with the JNTU, I worked hard to know the world trends in cinematography. I read a great many foreign journals, books, watched the practical tips on the CDs and took assignments based on that. I taught myself. I spent hundreds of nights studying the lens and its magic. This and all helped me a lot. The best part on me is that I bring to play the maximum resourcefulness in my ambit. I hold back nothing. I exert the last knowledge with me out for the maximum quality. I know I am just a beginner, and I hope I will continue to retain this feature in my profession till my last project. Tell us your experiences working for Nandanavanam 120 KM? It was a thriller. I studied each and every frame. I am thankful to Neelakanta for his confidence in me. This film is based on moods. I have to be thorough with the strategy to suit the mood with the frame – with the right ambience. Here, I am doing the unnatural and irregular. It needs creativity. I have to create the necessary paraphernalia to suit the mood. I have to glamorize the mystery element with the right lighting. The image should be neat and clear… without disturbing the audience. Focus should shift from scene to scene. This yardstick also applies to genres like Action and crime thrillers and ghost films. I just liked working with Vamsi. He is a perfect master of visuals. He also sees through the eye of a cinematographer. Again this film was a thriller. Particularly, this helped me whet my perception to be ever knowledgeable about the trends. This way, I came to adopt a very friendly approach towards directors. The work style of "You are giving the money and I should finish the work" doesn't work out. The relationship between the director and cinematographer will have a special flavor when it's a thriller. How do you enjoy the success of Ashta Chamma? To be frank, this film is the first in my career to generate a hit talk. Naturally, it places me in the clouds. But, I already told you. Nothing bogs me down and nothing elevates me to skies. I prefer to stay on the rock solid ground. It is the real platform of life and career. Success of Ashta Chamma enhanced my responsibilities. I should be more and more answerable to directors who believe my capabilities. Coming to the film, most part of the film was done on the locations where we shot Grahanam. I was a little bit nostalgic and this really aroused a sense of belongingness to the area and to the project as well. I got superb feedback from my friends and colleagues that the landscape and rural beauty captured in the film were great. Moreover, the success of a film also brings success to its cinematographer. I am also aware that it will bring misery to a cinematographer when the film fails, despite his best efforts. Other than Madhu Ambat, who else taught you the art of cinematography? Truthfully, it was Madhu Ambat only. The rest I learnt by myself. Journals of American Society of Cinematographers are like a direct blessing to me from God Almighty. I don't know why most of the big cinematographers (in our country and Tollywood) don't share their knowledge with others. Definitely, they are masters of their profession. They know highly valuable information. They are mines of experience which can't be bought even if we shell down billions of dollars. But, they are unwilling to share their knowledge. It is not the case with the Western people. What all they know, they just vomit it out for the public through articles, books and presentations in the seminars. That's why cinematography in Hollywood is the King. It is like a nameless but highly organized university and more than that a fraternity. I am thankful to Google.com. At a time when I had no money to purchase books and journals, it immensely stood by me. What's the main difference between our cinematographers and that of Hollywood? After all, technology is available to both the parties. Cinematography plays a very vital role in Hollywood films. Even if you don't like a story, you like the movie. It is because of the cinematography. Our audiences talk much about the technical perfection of Hollywood films, but they don't do it for our domestic films, though we maintain the best technical standards. We need to grow further and further. If you can seriously observe Hollywood films, most of them will have a single thread in their stories, but each time special effects or cinematographic techniques are developed with maximum care. That's why each time they appear fresh. We should first start sharing our knowledge. Without this, it's really a tough task for us to grow. So far, you handled films with budget constraints. If you get an opportunity to do big budget films, how might you feel? I once again tell you. Nothing can change my perception, which is clearly focused on perfection and quality. By working for small budget films, I am tuned to generate the best quality with minimal resources. In fact, budget big or small, doesn't affect a cinematographer. Our difficulty comes only when we are asked to do something like this: Taking risky shots by using ropes … without providing the cranes. Cinematography does matter a lot. It is high time; the filmmakers came out with the finest facilities to them. Having done thrillers and art films, don't you think you have missed capturing glamour in your camera? Absolutely glamour is like Queen when the camera is the King. There is something like "Clean and Neat Image". In a film, when the audiences are not visually disturbed, that itself is glamour. When I fail to match the visual with the mood, it is deglamorised. To talk about physical glamour of the artistes, particularly the female leads, we just change the focus. We don't need to take extra care. Object is our goal. Now that you are asking me, I hope I too will get a good time. I too heard the heroine congratulating the cinematographers for "effectively showing them." It is really a pleasing moment to hear them thank us, the cinematographers. Vinayakudu has a pretty heroine like Sonia. What about her? Yes. She is a beautiful girl and is very professional in her job. Certainly, the audience will find me capturing the glamour, which you have asked for. If you think glamour is something that is showing the heroine beautifully, I always did it. In Ashta Chamma, you will find that. In Vinayakudu too. Moreover, Sneha Geetham (in the pipeline) is out and out a youthful romantic entertainer. By the next five years, what you want to be? Naturally, I will be happier if I get recognition as a good cameraman, just good cameraman. What else will be there for me other than doing justice to my profession. Of course, I want to continue working for art films also. This was the genre which got me the platform to get into the feature mode. I am thankful to short films.